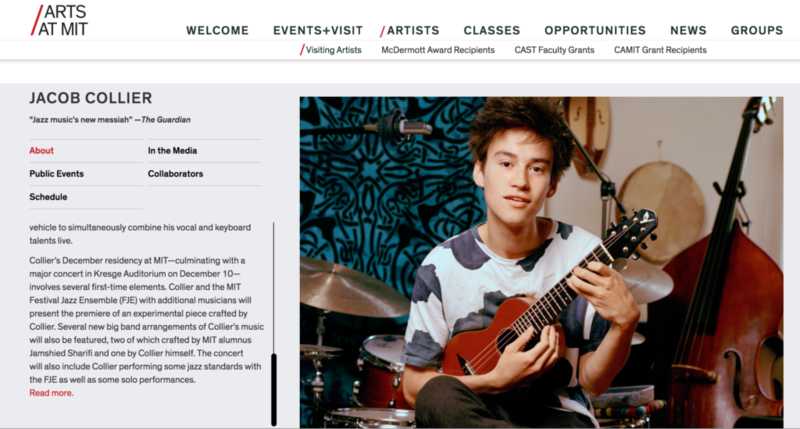 A unique project—Jacob Collier’s first-ever college residency—brings together the MIT Festival Jazz Ensemble, MIT’s Ben Bloomberg and other members of the MIT music community. Hailed by The Guardian as “Jazz’s New Messiah,” 22-year- old ground-breaking British musician Jacob Collier is a multi-instrumentalist, vocalist, arranger, composer, producer, music-video creator and a unique creative force with limitless potential. With musical interests ranging from the Renaissance to the present—and everything in between—this young artist epitomizes Ellington’s phrase, “Beyond Category,” which the Duke reserved for only the greatest musicians. Collier’s music combines elements of jazz, a cappella, world, contemporary classical, pop, gospel, R&B and soul. He is well known for his viral YouTube videos, which have turned numerous legendary artists into fans, including Herbie Hancock, Chick Corea, Pat Metheny, David Crosby, Jamie Cullum, Take 6 and Quincy Jones—now his manager/mentor. In 2014, he began working with MIT’s Ben Bloomberg (a graduate student at the MIT Media Lab) who helped transform Collier’s video productions into live one-man-show performances. Bloomberg also designed and created a custom unique Vocal Harmonizer, which has provided Collier a vehicle to simultaneously combine his vocal and keyboard talents live. Collier’s December residency at MIT—culminating with a major concert in Kresge Auditorium on December 10—involves several first-time elements. Collier and the MIT Festival Jazz Ensemble (FJE) with additional musicians will present the premiere of an experimental piece crafted by Collier. Several new big band arrangements of Collier’s music will also be featured, two of which crafted by MIT alumnus Jamshied Sharifi and one by Collier himself. The concert will also include Collier performing some jazz standards with the FJE as well as some solo performances. Collier grew up in a family of musicians and has honed his musical ideas from a very young age. He has embraced the world of the Internet to share his distinct form of creativity, becoming best known for creating his trademark multi-faceted YouTube videos from his music room at home, wherein he sings all the parts, plays all the instruments, and visualizes every component with a mosaic of screens. Since his first YouTube upload in December 2011, Jacob’s online social channels have garnered over 150,000 international followers and more than 7.5 million YouTube views. Founded in 1963 by Boston jazz icon Herb Pomeroy and led since 1999 by Dr. Frederick Harris, Jr, the MIT Festival Jazz Ensemble (course 21M.442), is comprised of outstanding MIT undergraduate and graduate students studying a wide range of disciplines. The FJE is a 2013 recipient of MIT’s Laya and Jermone B. Wiesner Award in the Arts. It is the only MIT entity that has earned this recognition three times (previous awards in 1991 and 1982), a testament to its consistent high quality over many decades. FJE has released five professional recordings including its major jazz label debut release on Sunnyside in 2015, Infinite Winds (a joint CD with MITWE). The CD which features FJE performing the world premiere recording of Chick Corea’s From Forever (composed for FJE), received a five-star review from Down Beat and was chosen by the magazine as one of its “Best Albums of 2015 Five-Star Masterpieces”—the first such recognition of its kind for a collegiate ensemble. The Boston Globe called the recording “one of the most compelling of 2015.” The FJE has a long history of performing original music by MIT students and composers from around the world. Since 2001, it has presented over 40 world premieres. Mark Harvey, Herb Pomeroy, Jamshied Sharifi, Ran Blake, John Harbison, Chick Corea, Joe Lovano, Kenny Werner, Don Byron, Steve Turre, Magali Souriau, Guillermo Klein, Bill McHenry, Chris Cheek, Miguel Zenón, Dominique Eade, Eviyan and George Schuller among others have worked with the MIT Festival Jazz Ensemble. Since starting MIT in 2007, Ben Bloomberg has worked for Professor Tod Machover at the Media Lab, touring internationally to design and support technology for Opera of the Future productions. He specializes in the design and implementation of advanced surround sound and audio systems for large venues, but he has created many kinds of live performance systems ranging from musical instruments to architectural lighting. Ben started running sound at age nine and has since engineered hundreds of shows in venues all over the world—his designs have been praised (with their associated performances) by critics for the the London Times, Chicago Tribune and Wall Street Journal. In his time on the road, he’s crossed paths with many artists, engineers and designers—from Björk to Ariana Grande, people seem to seek him out when there’s a challenge that hasn’t been seen before, requiring novel and highly customized solutions. At the lab and beyond, Ben works with his close friends to build systems which push the limits of performance and expression. Their goal is create technology which brings the performers closer to the audience instead of diminishing them in the presence of large screens or sets. The 2016-17 MIT Sounding Series is presented by the MIT Center for Art, Science & Technology (CAST) and MIT Music and Theater Arts.